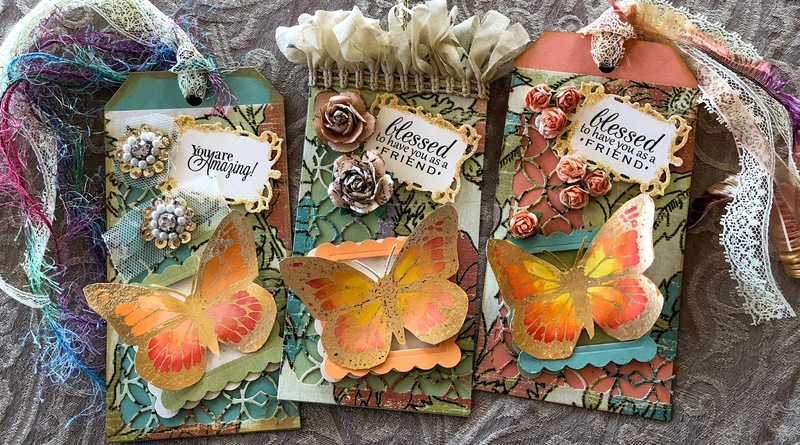 These elegant tags feature gilded and water-colored butterflies, complete with embellishments such as flowers, sequined jewels, ribbons and sentiments. You'll create your beautiful and bright butterflies using your favorite rubber stamp, some gold or silver leaf, and adhesive. I've published a step-by-step tutorial of the process if you'd like to click and have a look at either my Vimeo Tutorial or YouTube Video on Gilding and Watercoloring a Butterfly. To begin with, you need a tag base. 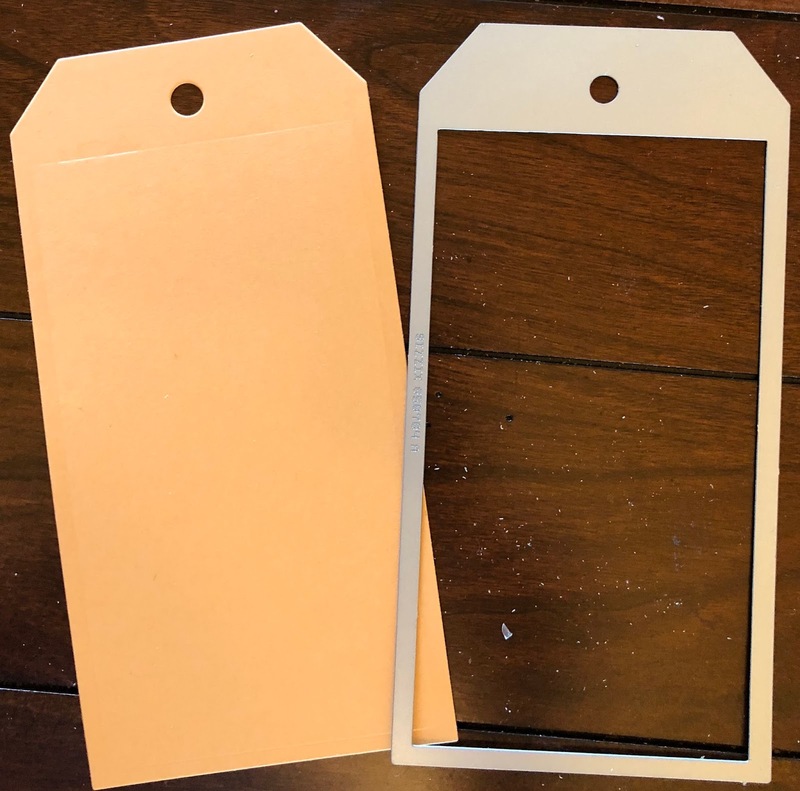 I used a Sizzix Framelits die to create a 3 1/8 x 6 1/4 inch tag using Big Shot. Then layer a piece of designer cardstock to 3 1/8 by 5 1/2 inches. Run this piece through Tim Holtz decorative die. Position the die 1/8 inch off the left and bottom of this cardstock, as pictured. Place the die-cut designer paper on the top of the tag. Use tape adhesive and a touch of glue. Optional: Rough up the edges of the tag with a distressing tool. Coral Tags: Use Tim Holtz Tarnished Brass Distress Stain to antique the edges of the tag. Pink Tags: Use Tim Holtz Worn Lipstick Distress Stain around the edges of the tag. 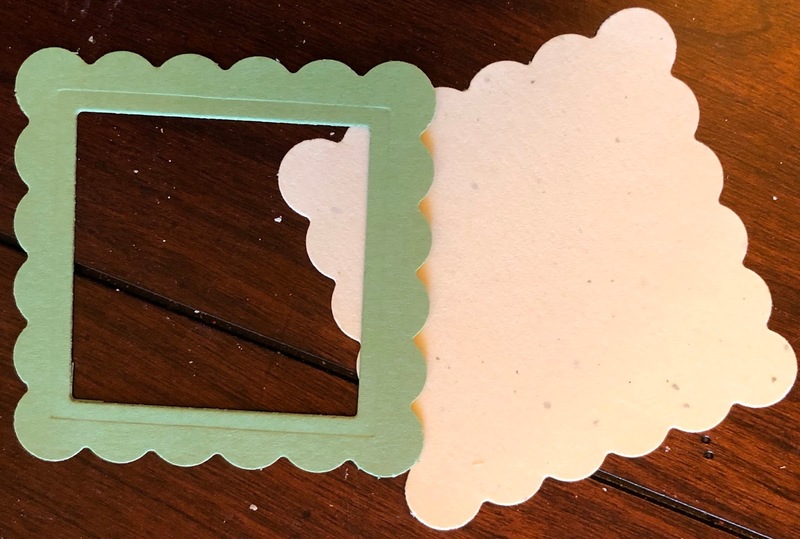 Create frames using scallop punch and Spellbinders square. The frames will be squares of 2 1/4 inches. Also use scallop punch to create background frame. 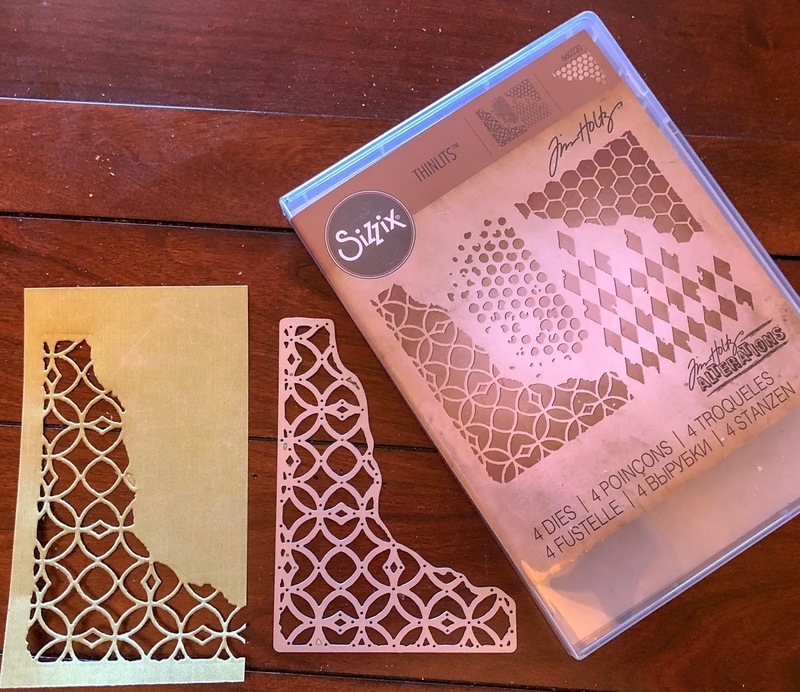 Place the cut-out frame on top of the scalloped square, using pop-up adhesive. Position the bottom scalloped square slightly off the edge to create a faux shadow. Tilt the frame at an angle, as pictured, using tape adhesive. Cut complementary colored ribbon or yarn for your tag. If you have trendy “fuzzy” or eyelash yarn, you can mix these materials with ribbons to create a more dimensional and interesting tag.